About Karate | Karate Dojo Heidelberg Sakura e.V. About Karate | Karate Dojo Heidelberg Sakura e.V. Empty (Kara 空) Hand (Te 手), the term already explains that it is an unarmed martial art, in which diverse body parts are trained in order be able to effectively defend against attackers. However, when practicing with a partner, it is important to not put the health of he other at risk. The attacks are supposed to stop immediately before the goal, which requires absolute control of the practitioner. The full rigor of the techniques is only deployed on baton posts (makiwara) or sandbags and the like. In addition, the term Kara represents a connection to the concept of emptiness (Mu, nothing) and the entire contents and concerns of Zen. Teaching (Do 道) is characterized by the four cornerstones: love, compassion, joy, and mindfulness. At the beginning of the 20th century, various karate masters founded their own styles according to their views. Gichin Funakoshi was always against it because he thought that there was only one karate. But his students named Funakoshi’s style after his stage name Shoto, pine noise. Shotokan can therefore be translated as the place of pine noise. Shotokan claims to have created a synthesis of the two great older schools (Shorin, Shorei) by combining strength and pliability, activity and passivity, attack and retreat. To answer the question about the benefits of karate, a quick tour into the past is helpful (for more details, read the relevant literature with all its speculations and lengths). An important date was the Japanese occupation of the island of Okinawa at the beginning of the 17th century, as a result of which the possession of weapons was banned. In order to protect themselves against unrestrained violent offenders, secret societies were formed, which over time developed local defense techniques, a mixture of the native Okinawa Te and the Chinese Kempo. At that time, it was imperative to tremendously harden the body and train arms and legs to steel-like weapons, as the opposing samurai wore armor that needed to be broken in order to win the fight. Over time, the exercises for achieving maximum impact were always improved, so that the body became a deadly weapon. When we cross swords with an enemy, we must not worry about being strong or weak. We should think only of hurting and killing him. The original system of passing on defense techniques was the compilation in a form (kata 形) in which the essential views of a master were passed on in encrypted form, so that they could not be understood by outsiders. 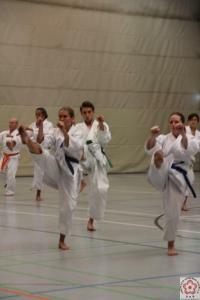 The applications of the individual sequences (Bunkai 分解) formed options for defense against one or more opponents. Originally, the techniques were intended primarily against armed opponents. This required an adaptation of the interpretations to new needs over the centuries. In particular, today’s self-defense allows the application of the basic options for action in adaptation to different situations and the physique of the opponent. Since one can take advantage of the weak points of the body today (there is no armor anymore), the enormous strength of the former fighters is no longer necessary to the extent that even “weaker” persons are quite able to properly defend themselves with the appropriate techniques. At the beginning of the 19th century, when the samurai vanished, one had to wonder why such hard training was necessary when the threat had disappeared. There was an increased focus on the lighter Shorin style, which now focused more on the inner conflict. It was the struggle inside for the perfection of the personality. The principles of Zen meditation have been adapted. Gichin Funakoshi took this into account when he changed the character Kara from the Chinese version to the Japanese one or changed the name of the Kata Kwanku, probably named after a Chinese envoy on Okinawa, to Kanku (Looking towards the Sky). Defeating the enemy without a fight is the highest art. In the 1920s, Gichin Funakoshi was allowed to hold a demonstration in front of the Japanese Crown Prince Hirohito, who was very enthusiastic about this art of karate on Okinawa. A few years later, Funakoshi founded the first dojo at Keio University. Karate came to Japan. Funakoshi’s disciples later rebelled against him as he practiced kata almost exclusively while they wanted to fight in duels. They founded the JKA (Japan Karate Association), whose aim was to spread karate worldwide via purely athletic competition, which they have achieved with great success. Some may find that sport is a degeneration of the actual karate, but to be honest, you have to be grateful, otherwise we certainly would not have so many opportunities to practice today. During this time, practicing only single techniques and combinations (Kihon 基本) was introduced, as well as beginner (Kihon-Kumite 基本 組 手) and advanced (Kiyu-Kumite), a duel from which the most dangerous techniques were eliminated and injuring of the partner is waived. In addition, the Randori is a partner form in which all techniques are allowed with particular care. The result was the competition with the comparison battles in Kumite and as a form contest in Kata. So today we are in the fortunate position that karate covers a wide field of activity in which anyone can choose what they want for themselves. A rating here is in no way appropriate. The fighter has his justification, the meditator as well as the one who solely seeks exercise in order to maintain their health or simply out of joy. The emptiness is not vulnerable, and you can not attack from nothing.